$5 for Jump Around Utah Pass in SLC! Anyone else been here? I went with my family last month and it was so much fun!! And I was amazed with how clean it was! My husband even jumped around a bit :):) At SLC Daily Deal you can get a Jump Around Utah Pass for $5! (orig $10) Adults get in FREE! There is FREE Wi-Fi there and you can buy up to 10 passes! 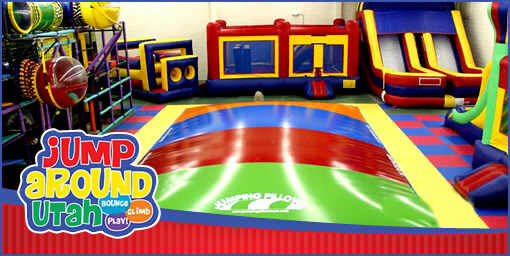 Get ready to jump for joy at Jump Around Utah! For only $5 (up to $10 value) you get an admission to open jump at one of Utah's largest bounce houses. Family and locally owned, Jump Around Utah is Salt Lake City’s newest indoor family activity center with inflatable fun for everyone. Jump Around Utah is a great way to have an excellent time for the whole family and at the same time get some good exercise!